For this year the fall means babies. Lots of babies. I would not be exaggerating to say that I know over 20 women who are expecting between the months of September and December. 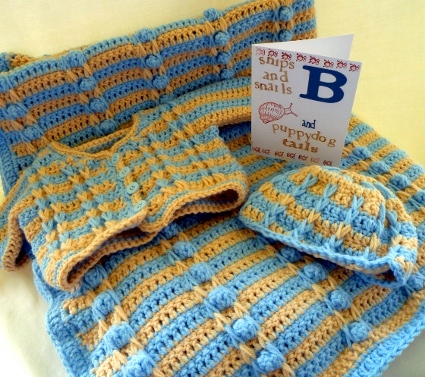 This Layette set is one that I came up with to give to one of my cousins that is having a boy in September. I usually refer to this cousin as my Minnesota cousin, but strangely enough he and his wife live in Texas right now. They are naming their son after the county that they grew up in, so that is why it is the Minnesota set. I wanted something that was fast and simple but had some visual and textual appeal. I also wanted a blanket that the baby could grow into and use for a few years. Row 1: With beige, fdc 110. Row 2: (Right side) Sc in each stitch across. have gone in, sc in next 8 stitches. * Repeat 8 times, long sc, sc ,long sc, sc in next 3 st.
Row 5: Change color. Dc in each st across. Row 6: Ch 1, turn. Sc in same st, sc in next 3 st.* Long sc around post of long sc of previous row, skip sc you would have gone in, sc in next stitch, long sc around post of long sc of previous row, skip sc you would have gone in, sc in next 8 st.* Repeat 8 times, long sc, sc, long sc, sc in next 3 st.
Row 9 to end: Repeat Rows 5-8, finishing with Row 6 in beige at Row 118. Rnd 1: Switch to blue; do not turn. Ch 1, sc in same st. Working down the long side, make 1 sc in each sc and 2 sc in each dc, working your way to the corner. In the corner make 3 sc. Continue making sc in each st across, making 3 sc in each corner, at the end make one sc in same st as the first sc, sl st into first sc to join. Rnd 2: Ch 5, 2 dc in same st, dc in each st around. At corner st, make 2dc, ch 2, 2 dc. Continue around to beginning st, 1 dc in first st, sl st in beginning dc. Finish off. Rnd 8: Ch 3, dc in each st around, sl st into first st.
Rnd 10: Repeat Rnd 8. Rnd 11: Change colors, ch 1, sc in same st and in next 2. Long sc into post of long sc of previous row, *sc in 3 sc, long sc* repeat around, sl st into first st.
13, 15, 16, 17, are the rounds that you will change. Finish off and weave in all ends. the seams of the sweater. Row 1: Make 32 fdc. Row 7-12: Repeat Rows 5 and 6. Row 14: Ch 17, turn sc in each ch across. Repeat row 4, make 14 fsc. Row 19: Ch 3. Dc in each st across. Row 20- 23: Repeat Rows 18 and 19. Row 26: Ch 1, turn, sc in same st, sc in next 20 sc, long sc, sc, long sc, sc in next 5 sc, make 2 fsc. Row 28: Ch 1. turn, sc in same st, sc in next 20 sc, long sc, sc, long sc, sc in next 3 sc, long sc in dc of row 25, sc in next 3 sc, make 2 fsc. Row 30: Ch 1, turn, sc in same st, sc in next 20 sc, long sc, sc, long sc, sc in next 3 sc, long sc, sc, long sc in dc of 27, sc in next 3 sc. Row 32: Ch 1, sc in same st, sc in next 3 sc,* long sc, sc, long sc, sc in next 3 sc,* repeat. Row 33- 42: Repeat Rows 31 and 32. Finish off. sc in next 20 sc. Row 19: Ch 3 turn, dc in each st across. Row 20: Ch 1, sc in same st, sc in next 2 st, long sc, sc, long sc, sc in next 21 sc. Row 21: Repeat Row 19. Row 23: Repeat Row 19. Row 24: Ch 3, turn, sc in second ch from hook, and next ch, sc in next 3 sc, long sc, sc, long sc, sc in next 21 st.
Row 25: Repeat Row 19. Row 26: Ch 3, turn, sc in second ch from hook, and next ch, sc in next 5 sc, long sc, sc, long sc, sc in next 21 st.
Row 27: Repeat Row 19. Row 28: Ch 3, turn, sc in 2nd ch from hook, and next ch, sc in next 3 sc, long sc into dc from row 25, sc in next 3 sc, long sc, sc, long sc, sc in next 21 st.
Row 29: Repeat Row 19. Row 30: Ch 1, turn, sc in same st, sc in next 3 st, long sc into dc of row 27, sc, long sc into long sc, sc in next 3 sc, long sc, sc, long sc, sc in next 21 st. Finish off both colors. Row 31: Turn. Skip 16 sc, join and ch 3 in next st, dc in next st across. Row 32: Ch 1, sc in same st, *sc in next 3 sc, long sc, sc, long sc* repeat *to * sc in next 3 sc. Row 33: Ch 3 in next st, dc in next st across. Row 34-42: Repeat Rows 32 and 33. 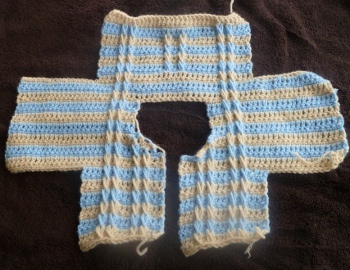 Finishing: Fold sweater along sleeves and sew up the sides and the arms. Rnd 1: Join with a sc at the left side of the seam with the right side facing. Make an even amount of sc around the sleeve, making sure to weave in the loose yarn ends as you go around. Sl st into first sc. Rnd 2: Ch 1, sc in each sc around. Sl st in beginning sc, finish off. Rnd 1: Starting at bottom of the sweater (so you will work your way up the collar and around with right side facing), ch 1. Make 2 sc in same st, make 2 sc in each dc post, 1 sc in each sc post. Repeat till collar. Working around collar sc in each st, but skip the posts. Continue to make 1 sc equally around till you come to the first st, sl st into first sc. Rnd 2: Ch 1, sc in same st, sc in next 2 sc. *Ch 2, sk 2 sc, sc in next 3 sc. * Repeat 3 more times, continue making 1 sc in each sc. On corner spaces make 3 sc. At end of round, sl st into first sc, finish off. Weave in all ends. Add buttons to match up with the button holes. 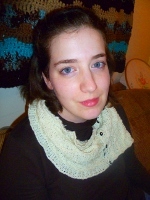 Julia Schwartz is the wife of a seminary student, a mother of a three year old daughter, and a daughter of a long line of crafters. 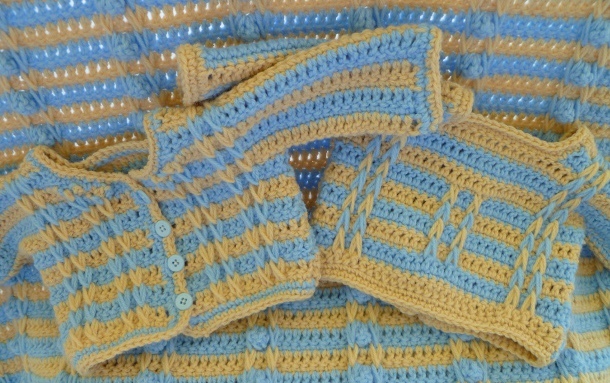 She has been sewing since she was five, cross stitching since she was ten, and picked up crocheting and knitting in college. Right now life is very exciting and busy as she is contemplating a move to Toronto so that her husband can start his doctorate work in 2013. What does fdc and fsc mean ? Lorraine, please explain how to start out with a fdc on the Minnnesota Sweater Row 1 : fdc 110. I do not understand this, Evidently there is a different way to fdc to start a row than what I am use to doing. 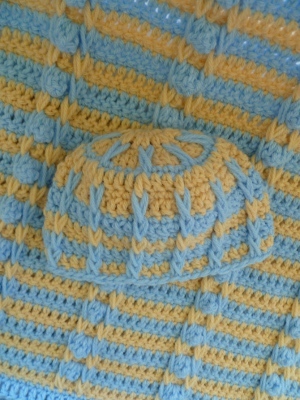 I have used this stitch on a previous row, but not to begin a row. Please help! the pattern is very beautiful. i will follow pattern and make it. it is absolutly beatiful. This is Beautiful!! I just love it. Thank you so much for sharing your talent with us. Can anytone tell me how to begin a row with a fdc (no previous row)? Love it! And the Swedish colors for that group of Scandinavians in MN. Works well for my family.